An uplifting story of unlikely friendship and hope during the Iraq War. After the overthrow of Saddam Hussein, First Sergeant Daniel Hendrex was dispatched along with his unit, Dragon Company, to Husaybah, a small town bordering Syria in the Sunni-dominated Al Anbar Province in Iraq. Their mission was to plug the bottleneck at the border checkpoint, where foreign fighters and weapons smugglers were filtering through daily to join the increasingly menacing insurgency growing rapidly in the region. It was at this checkpoint, amid relentless attacks, that Daniel and his men found the most effective ally of the war effort in the most unlikely of sources. In December 2003 a skinny Iraqi kid about fourteen years old approached one of the soldiers at the border and said simply, “Arrest me.” Jamil, as he was called, claimed to have valuable information about the insurgency, but First Sergeant Hendrex was skeptical—especially when the boy announced that the man he wanted to turn in was his own father. The story that unfolds is one of heartbreaking tragedy, remarkable courage, and unprecedented resiliency, as this child of the insurgency takes it upon himself to fight back with the help of the US Army...and loses everything in the process—his country, his home, and his family. But through the power of his own conviction and his finely honed survival skills, Jamil (who was quickly nicknamed Steve-O by the soldiers of Dragon Company) sought refuge with the US military in exchange for information. He risked everything he knew for a chance at freedom—a choice few men, let alone children, have to make in their lifetimes. And after Steve-O helped save countless lives, First Sergeant Hendrex made it his personal mission to repay his debt and get the boy to safety. 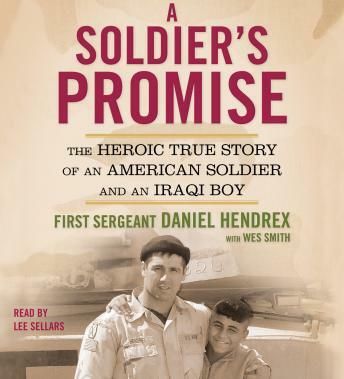 A Soldier’s Promise is an incredible story of sacrifice and courage by an Iraqi boy and the US soldiers who protected him from certain death by bringing him to the United States. It’s an astonishing tale of two countries and two very different kinds of people joining together against terror and tyranny, and of the young man who, against all odds, gave Dragon Company what they desperately needed—hope.